If you use VBScript to validate user input on a web page at the client side, using VBScript's built-in regular expression support will greatly reduce the amount of code you need to write. RegexBuddy makes it very easy to use the RegExp object in your VBScript source code and web pages. If you copied a regex written for another programming language, simply paste it into RegexBuddy, select the original language, and then convert the regex to VBscript. 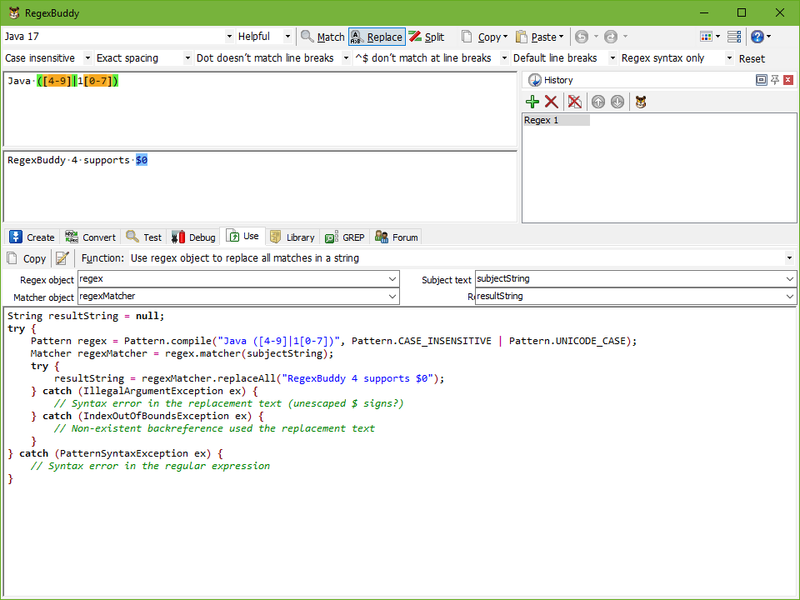 If you created a new regular expression, test and debug it in RegexBuddy before using it in your VBScript source code. Test each regex in RegexBuddy's safe sandbox without risking precious data. Quickly apply the regex to a wide variety of input and sample data, without having to produce that input through your script. Finally, let RegexBuddy generate a source code snippet that you can copy and paste directly into whichever IDE or code editor you use. Just choose what you want to use the regex for, and a fully functional code snippet is ready. You can change the names of variables and parameters to suit your naming style or the current situation, which RegexBuddy automatically remembers. Don't bother trying to remember VBScript's specific regexp syntax. Just tell RegexBuddy what you want to do, and you will get the proper VBScript code straight away. Anything can be done: testing a string for a match, extracting search matches, validating input, search-and-replace, splitting a string, etc. "I have to say that RegexBuddy is an invaluable tool. It is by far the best regular expression tool that I have ever used. I used to waste time trying to debug my Perl regex's using tons of simple 'print' statements. All that is gone and I definitely now have a better understanding of the more advanced features of regular expressions thanks to this tool. "The best part of RegexBuddy is that I can enter a regex that I wrote in Perl, and can easily convert it to a different language. Sometimes the only option I have is to use VBScript, and being able to quickly and easily convert my Perl regex to VBScript is a huge timesaver. "I also love the "Comment with RegexBuddy's regex tree" feature. Adding this regex explanation to my code really helps the uninitiated understand what I've done, and makes my code easier to maintain.